This is even ignoring common complaints like 3G coverage and download speeds. I just keep having billing problems. Even when I worked for them, I had billing problems. I wonder if Apple realizes how poor customer service can tarnish user experience. I didn’t notice the extra charges because I set up autopay on my account. I set up autopay because supposedly we have unlimited data plans and enough minutes that we’re not likely to go over. So the deal is, all AT&T has to do is bill me correctly and they will automatically get thousands of dollars of the life of the 2-year contract. All I have to do is keep some money in my bank account and I don’t have to waste time licking stamps and writing checks. The customer service rep was nice enough, but it took nearly an hour to resolve. Where do I send an invoice for an hour of my life wasted? I need to pay more attention to the autopay stuff in my bank account. Which sort of defeats the point of autopay, though I guess it’s still better than licking stamps. I need to seriously consider jumping over to the G1, which runs Google’s Android operating system. One more hiccup on my bill and I’ll even eat the $175 early cancellation fee. Yes, that’s right, I’m actually considering paying extra money to stop service. Nice business model. Free service for the next 5 months is nice, but I’ve essentially been extending AT&T an no-interest loan this whole time. I wonder if that qualifies me to get bailout money? If you’ve run into similar problems, feel free to comment below. Angry blog posts are a good way to vent frustration, or at least it works for me. That’s ridiculous – I’ll share a similar story that luckily did not prove to be too costly. When I moved into a new house after graduating college my old housemates were kind enough to leave the Comcast modem there. So, I call Comcast and tell them I’d like to activate the Internet. So they start to say they’ll schedule some time during the day to come over and hook up a new modem and activate the line. I tell them we already have a modem. The rep tells me that the modem is supposedly unique to each account and should have been returned when the previous tenants move out. What they left us doesn’t work which sounds like a total scam to me. So, I have to pay some installation fee to get a new one installed. To make matters worse, they tell me that someone from Comcast will come between 8AM and 12noon to install it. Good thing my unemployed housemate was available to see the installation through. My husband bought the RAZR when it came out. Of course we are both “loyal” (is there a visual character for biting sarcasm?) at&t customers…. thanks to hefty breach-of-contract fees and lately ..*sigh* the addictive iphone. SO my husband got the RAZR when it came out. Phone never performed well out of the box so after haggling and spending countless hours on the phone with customer service reps who should be quarantined for the threat of causing aggravated rage, miraculously they offered to send him a new replacement. Imagine our “surprise” when right before the end of our 2 yr contract the not-too-old RAZR # 2 decided to conk out. So again my husband (who had by now become adept at haggling with at&t customer service) called in and worked his magic into making them send him a new replacement (they would’nt give a different phone) for a nominal fee of around $50. So we thought, well twice unlucky thrice might be a charm, so we got RAZR # 3. Soon after our contract expired & since the blackberry deals were so delicious then we both got us the a berry each. The RAZR # 3 ..barely used …was stored in new keypad protective cover et al. Fast forward 18 months. The husband loses his blackberry so we go to the store to request a SIM & see if we can use almost new RAZR # 3 as backup. 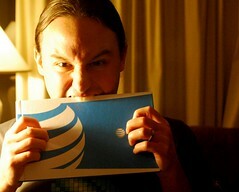 After all it is all within the at&t family. But well… my eyes meet the iphone 3G (which is now significantly discounted thanks to its 3GS cousin), and we decide that I am ready for an upgrade. (Meanwhile at&t has been actually billing error free, glitch free, customer service call free!!!!) So I get an iphone 3G & sign a new 2 yr… hubby gets my blackberry & a replacement SIM card… one happy family goes home. Two months later, hubby’s (my ex-) blackberry gets lost again (men!!!!aargh). This time, hubby can upgrade but he doesn’t want to rush so he wants to use the RAZR while he’s making up his mind between an iphone or some other snazzy gadget on the at&t platter. Three things happen simultaneously after a 3.5 yr hiatus. AT&T owes me $450 and refuses to pay, for 1 year of service that they have be overcharging me at $50 a month. I ordered the family talk plan, and they had set up my husband on that plan, and me on some plan that cost $50 more a month, without telling me. I had gone to the AT&T store to buy my iPhone and said I want the Family Talk Plan. My husband bought his phone a couple of days later from an AT&T kiosk in the mall, and said to put him on my Family Talk plan. For some reason, the guy took me off of the Family Talk plan, and put my husband on it by himself. If I had not gone in to get my husband a new iPhone, I wouldn’t have known. The bill is not very clear on what plan I have.